Because I know of no other way to do it. PLUS, I am a fruit freak and any chance I get I am going to add a few slices or mango or some fruit salsa. To me, fruit enhances just about every meal. So clearly, I am pretty pumped about all the pretty berries (and even watermelon, corn and peaches) filling up my grocery produce section. YEAH for mid spring and early summer produce!!! SOO. I know that these Carnitas Chilaquiles with whipped jalapeño cream seem like they are some hefty Chilaquiles, and that’s mostly because they are. I hear you, to be honest, I wouldn’t be able to eat these before noon, I just can’t do a giant meal like this so early in the day. BUT anytime after that, these would totally be fair game. They are what I am calling LOADED Chilaquiles. 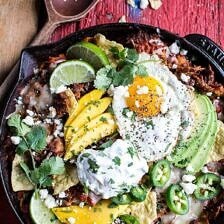 Which by they way, Chilaquiles are basically just fancy nachos that get lightly fried and tossed with red or green salsa. They can be made all different kinds of ways, but I went heavy on the Mexican and just threw in some homemade carnitas. So you see, HEFTY yes, but so good! And so worth every ounce of effort. Trust me on this one. Making the carnitas is easy. All they involve is a pork roast, a handful of spices and some beer… OR some coke, which according to my neighbor Vern, is very traditional in Mexico (he’s semi loony though….JK,JK,JK). He’s says you can’t make carnitas without a can of coke. I personally say otherwise since I never drink coke and therefore never have it on hand. Per his request though, I tried making my carnitas with a can of coke and yes, they were awesome. Still not sure whether that can of coke was any better than a can of beer though, but I will let you guys decide that one. Either beer or coke will work, but please, tell me your thoughts!! 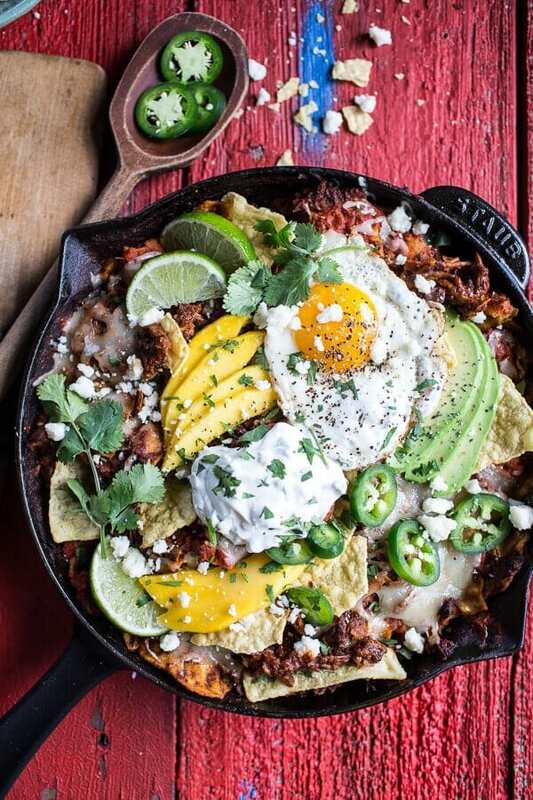 Once you have your carnitas, it’s time to make some KILLER Chilaquiles. 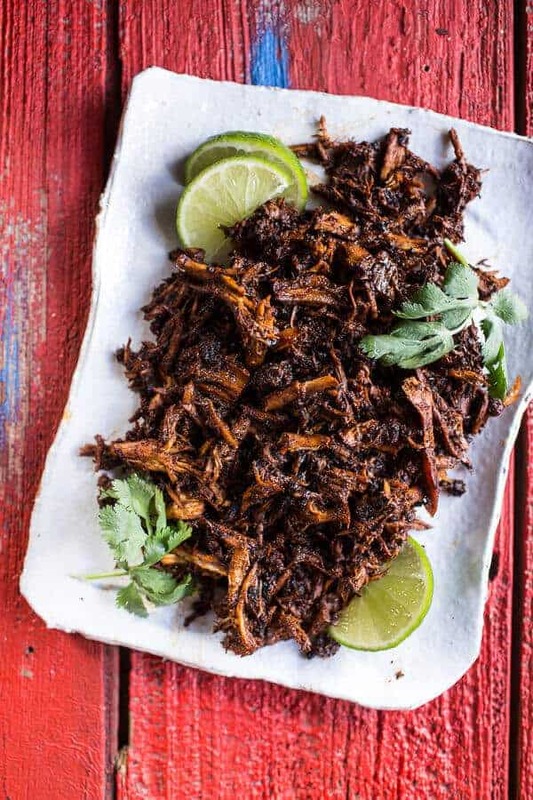 Oh but, just a FYI – you will have a lot of left over carnitas, so be prepared to make your fair share of burritos, tacos, salads and quesadillas with all the leftover meat. Hey, you’ll have meals to last till Monday. YEAH!! Ok so, you have your carnitas, now you need to make a little sauce in the blender, simmer it, add some tortillas chips, cover said tortilla chips in carnitas and cheese, and throw it all under the broiler to melt. Make a quick whipped jalapeño cream (OH MY GOSH, this stuff is awesome. Sweet, spicy and way better than a boring dollop of sour cream or crema). 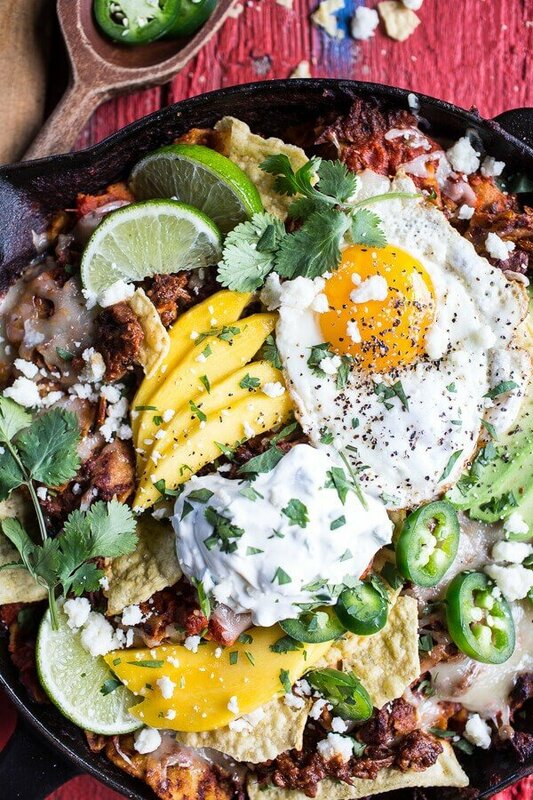 Remove the Chilaquiles and immediately start topping. 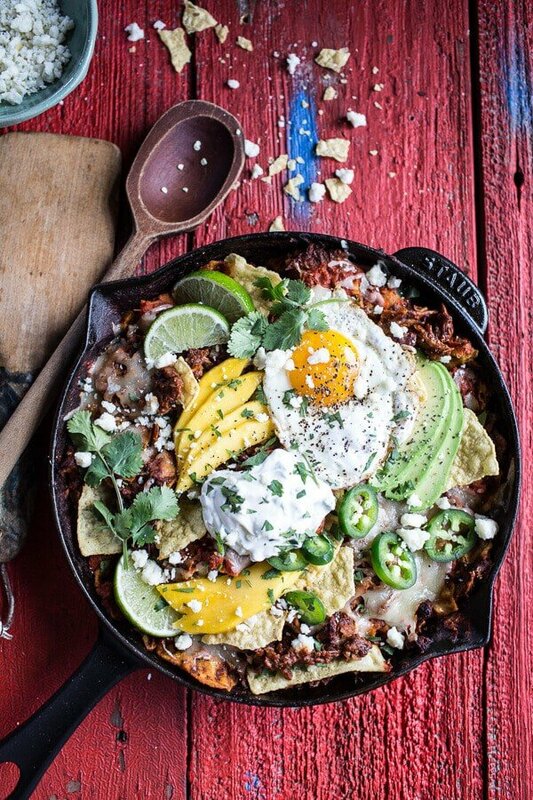 And by toppings, I do mean add everything that could possibly be good on Chilaquiles, which really just means FRIED EGGS. I mean, duh. Oh and ok, and some fruit salsa or sliced mango, but we already chatted about this. You really NEED the eggs though. Like no questions. Also, cotija cheese and fresh cilantro would be awesome. Oh, and avocado too, if that’s your thing…obviously it’s totally my thing. And then you could be all prim and proper and start dishing out the meal. OR… you could just go Gerard family style and dig in with a fork. Did I mention that no one ever taught us Gerard kids (at least me and my brothers anyway, not speaking for the cousins) any table manners? And my mother was a debutante… guess she decided to go the other way! Oh well, when it comes to eating, table manners aren’t really all that fun anyway. Chilaquiles are basically just fancy nachos that get lightly fried and tossed with red or green salsa. They can be made all different kinds of ways, but I went heavy on the Mexican and just threw in some homemade carnitas. So you see, HEFTY yes, but so good! Combine seasonings (salt, pepper, smoked paprika, cumin, onion powder, chipotle chili powder, oregano, cayenne, garlic powder) together in a bowl and mix until combined. Heat a large skillet over medium-high heat and add oil. Rub the pork all over with about 1/3 of the seasonings. Once hot, add the pork and sear on all sides until golden brown (about 2 minutes per side). Next add the pork to the crockpot and sprinkle all over with remaining seasonings. Pour in beer (or coke), orange juice, and lime juice, then cook on low for 10-12 hours (oven version in the notes). Check once or twice if possible. Before serving, use forks or kitchen tongs to shred the pork in the crock pot. Mix to combine with the remaining liquid in the crockpot. This will make more pork than you need for the Chilaquiles, so be prepared to make some tacos, sammies or burritos as well! In a blender, combine the tomatoes and the chipotles chilies, blend until almost smooth. In a very large, deep skillet, heat the oil. Add the onion and cook over medium heat until lightly caramelized. Add the garlic and cook for 1 minute or until fragrant. Pour in the tomato mixture and simmer, stirring until slightly thickened, about 5 minutes. Stir in the chicken broth and boil the sauce over high heat until just thickened slightly, about 2-4 minutes. Season with salt and remove from the heat. Sir in a handful of chopped cilantro. Pre-heat the broiler. Gently stir the tortilla chips into the sauce, making sure they are well coated. Top with shredded carnitas and cheddar cheese (or whatever cheese you are using). Place under the boiler to melt the cheese. Remove and top with mangos and or fruit salsa, avocado, cilantro and cotijia cheese. Dollop with whipped jalapeno cream. Serve immediately. Add the greek yogurt, cream cheese, honey and salt to a mixing bowl. Beat on high speed until light and fluffy, about 3-5 minutes. Stir in the Jalapeños. Store in the fridge until ready to serve or up to 1 week. 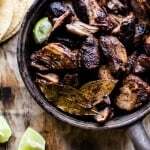 *To make the carnitas in the oven, Preheat an oven to 350 degrees F. Combine seasonings (salt, pepper, smoked paprika, cumin, onion powder, chipotle chili powder, oregano, cayenne, garlic powder) together in a bowl and mix until combined. Heat a large dutch oven over medium-high heat and add oil. Rub the pork all over with about 1/3 of the seasonings. Once hot, add the pork and sear on all sides until golden brown (about 2 minutes per side). Remove from the heat and sprinkle the remaining seasonings over the pork. Pour in beer (or coke), orange juice and lime juice, cover and cook for 3-4 hours. Check once or twice if possible. Before serving, use forks or kitchen tongs to shred the pork in the crockpot. Mix to combine with the remaining liquid in the crockpot. This will make more pork than you need for the Chilaquiles, so be prepared to make some tacos, sammies or burritos as well! 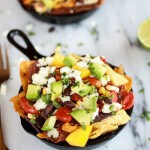 *Chilaquiles sauce inspired by [Food and Wine | http://www.foodandwine.com/recipes/chipotle-chilaquiles]. I feel like everyday should involve food as awesome as this. Yes, it should! 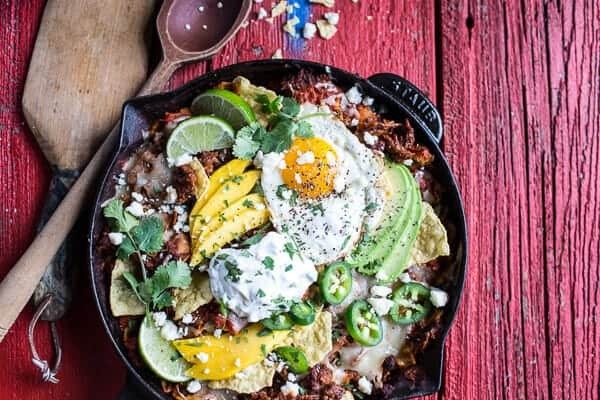 I’ve never tried to make homemade chilaquiles, but this is the perfect reason to start! Wow, this dish is packed with all my favorite things! Also… when is your restaurant opening? You have such amazing creativity with your food! Great recipe! Yum! This looks insanely delicious. I’ve been wanting to try making chilaquiles and now I have a reason to give it a shot! Gorgeous photos by the way! 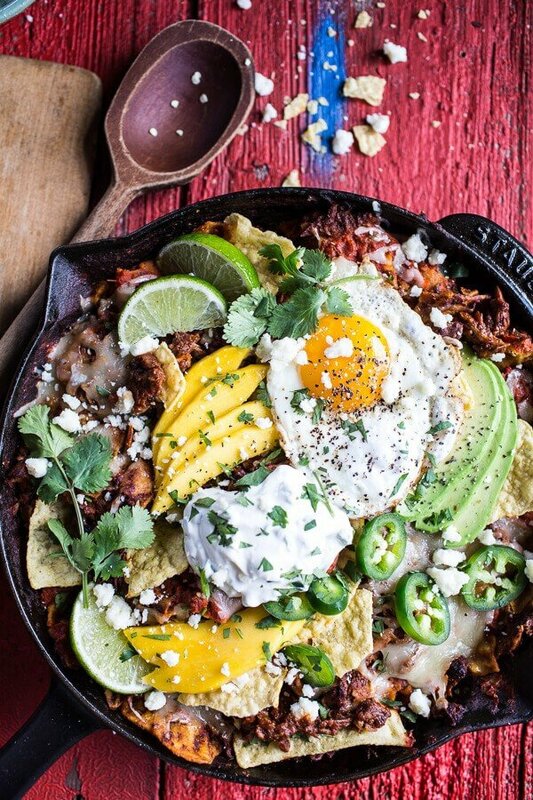 Oh man…and those toppings are…well…the topping on the chilaquiles! 🙂 Looks SO good! Thanks so much, Cassie! Hope you are having a great week! 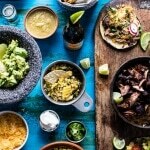 Living in the PNW it’s impossible to find good, authentic Mexican food (believe me, I’ve tried!!) which means I cook WAY more Mexican food than when we lived in Southern California. The jalapeño cream sounds amazing….definitely adding this next time I make chilaquiles! You are wonderfully creative!! You can never add too much fruit to balance the spice of Mexican food! Thanks so very much for the beyond sweet words! Hope you are having a great week! Thank you!! And yeah, sometimes I wonder if I overdo it (which I do), but I do not know, that’s just me I guess. 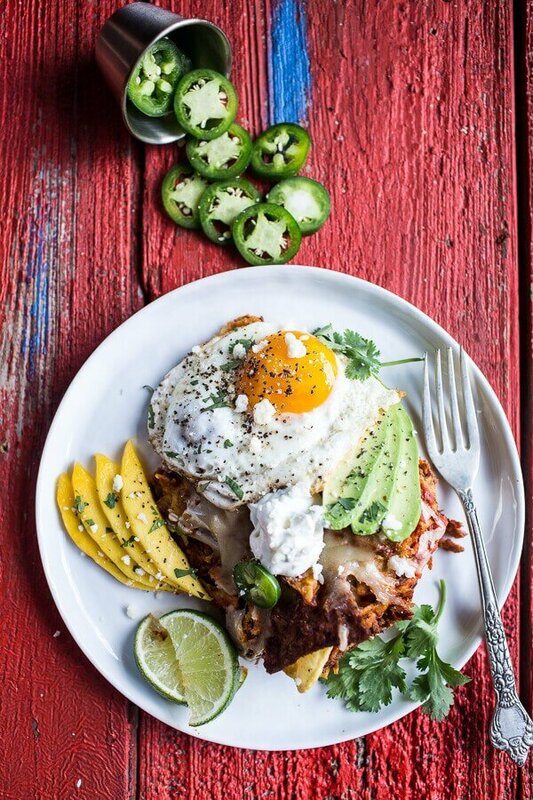 Woah – I don’t even eat meat but am thinking of all the veggie dishes I could add that jalepeno whipped cream to! No credit to Rick Bayless’ recipe that this is (obviously) copied from? 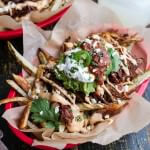 For sure making the carnitas with the coke and then using all the health ingredients with it–OH some chips too. oh my gosh, I want all of this so, so, so much. Just looking at the pictures + reading your words is making me frantic to make this. It was awesome! Thank you for the recipe! I wanted to pop by after making this for dinner last night. It was fantastic. The slight sweetness of the carnitas melded so well with spicy chilaquiles sauce. Just wonderful. I think several of my friends are already looking to make it themselves. This looks amazing! I’m a big chlaquiles fan! The Whipped Jalapeño Cream sounds amazing. This dish is on my to do list! I am in the middle of making this recipe. I cooked my pork in the crock pot, but the picture of your pork on the plate looks like it is coated in something. I know the recipe says to dip the chips in the sauce, but are you to coat the pork in the same sauce too? I will say, that the pork has a great flavor/taste, but doesn’t look like yours at all. I just found your blog and your photography is INCREDIBLE! I can’t wait to make these this week! Looks amazing. I just made this last night and both my husband and I enjoyed it. It was a LOT of work, but I still managed to get it out on time for dinner. I completely forgot how long it took, so I had to halve the time and cook on high in the slow cooker. The flavor was great, I love cilantro and went a little crazy with it in this recipe. I was sad that my avocadoes did not work out because they could have made this dish that much better. But I think my favorite parts were the fried eggs and the jalapeno cream. So sorry about the trouble. Recipe is all fixed. Let me know if you have other questions. hey tieghan! I’m having the same issue still – the recipe says 1 oz of tomatoes, but there’s a note at the end that says 28 can? same with the amount of pork and coke – could you let me know how much to get of each?